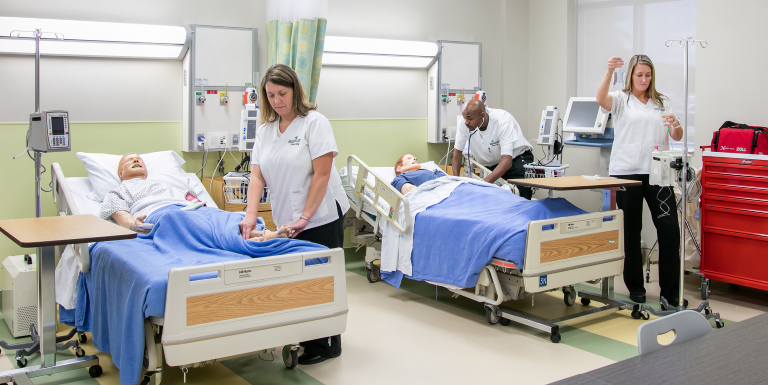 Every student who graduated from Jackson State Community College’s nursing program in 2017 passed the National Council Licensure Examination (NCLEX) on his or her first attempt, an achievement that earned praise from the Tennessee Board of Nursing. The NCLEX is a nationwide exam for nursing school graduates to obtain a license, which allows them to practice. It is administered by the National Council of State Boards of Nursing. Jackson State typically has a high pass rate on the NCLEX, and it is not unusual for every student to pass. Now in its 27th year, the school’s nursing program has earned a reputation as one of most respected in the state, and it continues to enhance its offerings, said Dr. Leslie West Sands, Dean and Program Director of Nursing. The Jim Moss Center for Nursing, which opened in 2015, features state-of-the-art labs and equipment that utilize the same technologies as hospitals. Equipment in the facility includes human obstetric, pediatric, and adult simulators that enable faculty to simulate real-life scenarios. The two-year registered nursing program also has a high employment rate. In a survey, 100 percent of those who responded reported being employed as a registered nurse within a year of graduation; only two percent of graduates surveyed did not respond. Jackson State Community College provides accessible learning opportunities that enhance the lives of individuals, strengthen the workforce, and empower the diverse communities of West Tennessee. The institution offers traditional and contemporary associate degrees, certificates, continuing education and enrichment, and college-readiness programs. John McCommon is the Public Relations and Marketing Director at Jackson State Community College in Jackson, Tennessee.